Provides the ability to control the desired amount of load as needed. Is the OAdjuster Osteoarthritis Brace right for me? Ideal for moderate to severe ligament instabilities and post-knee surgery. Try our Brace Advisor for personalized product recommendations to meet your needs! Revolutionary "Progressive Loading System" for Relief! Designed for moderate to severe, unicompartmental Osteoarthritis. The OAdjuster is recommended for ligament instabilities and post-operative rehabilitation. The OAdjuster offers "Progressive Loading System", providing an integrated patient-controlled load adjustment. The Bi-Axial hinge allows for a double upright design to contour to the leg and fit comfortable, without migration. The Load Sensor, a DonJoy exclusive, helps to determine the forces being applied by the brace. Medial or Lateral refers to the affected compartment. The joint most often affected by osteoarthritis is the knee. Knee OA is caused by the degeneration or breakdown of articular cartilage that covers the ends of the bones that meet at the joint. Cartilage serves as a cushion between the bones, providing a smooth surface for the bones to move against each other. When the cartilage deteriorates the bones may actually be rubbing together. Your physician will often refer to this as "bone-on-bone" osteoarthritis. What is Osteoarthritis (OA) knee bracing and how does it work? Knee braces are available that are specifically designed to support a knee affected by OA. They stabilize the joint, help reduce pain which allows patients to return to the activities they love. Load redistribution and joint alignment Through a process called "off-loading" or shifting, OA braces help relieve pain by redistributing the weight bearing load on the painful or affected compartment of the joint to the healthy or unaffected compartment. Braces cannot cure OA and may not be right for everyone. However, it is a viable solution for many people. The ideal candidates are typically active people who are motivated to strengthen their muscles and willing to wear a brace to realize the benefits of this form of treatment. Discuss treatment goals with your doctor and others on your health care team before you get a brace. Don't expect a brace to feel good from the start. It may take from a week to a month to get used to how the brace feels on your leg. Be patient. It took a long time for your knee OA to develop. Bracing has come close to eliminating pain for some people with knee OA, while others experience moderate relief. For replacement kits and straps, visit the OAdjuster replacement parts category. Unfortunately, as a website, we do not do insurance billing for any of the braces, including the DonJoy OAdjuster. However, our parent company, DJO Global, does and they will be able to assist you with looking into your insurance coverage. Their number is 800-548-3370. I am looking for the right size brace. Will M size will be best for me? Can I use this brace for skiing? I am seeking to purchase the product in the below link through better braces, but am not sure if it is the same product. On the DonJoy OA Adjuster brace, what thickness are the original condyle pads on this brace and what are they made out of. My Don Joy OA knee brace does not stay up. Continues to fall no matter how tight I make the straps. Any suggestions? You should take the barce back to the practitioner that fit you and see if they can make some adjustments to the brace to help it stay better. The main reasons for this would be that the brace is the wrong size. 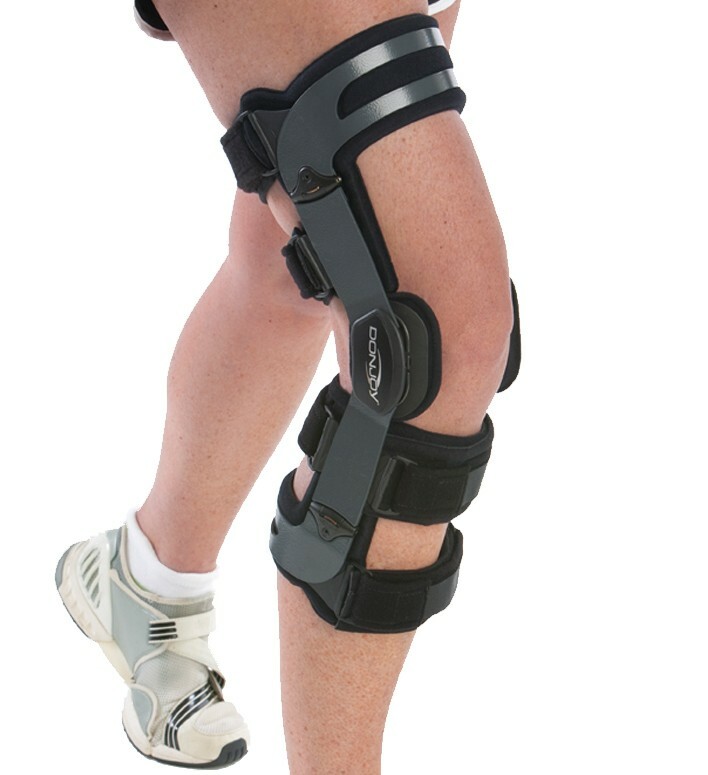 Do you sell strap kit for OA Adjuster Osteoarthritis knee brace size large left without pads just straps? I have osteoarthritis in both knees. I love to run so I'm looking for a brace for both knees . The cartlidge in both knees is worn down which is giving me my pain. Any help with braces would be greatly appreciated. i have moderate oa on the inside(menial)of my right leg.i work full time in retail lifting 20lb items,bending my knees many times with this weight.which brace is the least bulky,seeing that i would need to wear it under my pants.thank you for your responce. I had meniscus clean up and in doing so the doctor found out I have very early stages of OA. The OA is on my right knee on the inside. I work in a warehouse so I am looking to get a load bearing brace. I was wondering which one you would recommend for me. Thank you for your time. The OA Lite is for those who have mild arthritis. It is a sleeve with a single upright and hinge on the opposite side of the knee in which you would need unloading. In your case you need a medial unloader so the hinge would be on the outside of the brace. The brace comes pre-loaded at 3 degrees of correction. The upright is malleable so it can be bent to allow further load up to 6 degress. https://www.betterbraces.com/donjoy-oa-lite-osteoarthritis-knee-brace The next step up from this brace would be the OA Full Force, OA Nano and the OA Everyday. The OA Everyday is for non-active people, the OA Full Force is for active individuals and the OA Nano is for highly active people. All of these braces are for mild to moderate OA in the knee and have a adjustable hinge that can adjust offloading. Is this price 649.99 just include one adjuster or a pair of adjuster? Like there is a problem with both of my knees, do I need to buy 2 adjusters separately, or this is exactly a pair of it? Thank you! My therapist recommended you and the OAdjuster Osteoarthritis Knee Brace. Do you recognize Tri Care and Medicare for payments??????. $650. is a lot of money for something you don't even know will work or not.. Thank you for your question. You can contact you DonJoy rep, they may be more knowledgeable in the coverage of insurance. To locate your rep, type your zip code in to the following link. http://www.djoglobal.com/contact-us/sales-rep-locator . We also offer a 90 money back guarantee if you do not like the brace for any reason it can be returned for a full credit back to your account. If you have any additional questions please feel free to contact us. I have osteoarthritis in all 3 compartments, chondromalcia ( level 4), medial and lateral minicus tears, posterior horn tear, quadriceps and patellar tendinitis, and a large Baker's cyst. What brace would best suit me? I'd like to play tennis! Thank you for your question. Our rigid braces are designed specifically for Medial or Lateral Osteoarthritis. You might want to look at the DonJoy Deluxe Hinged Knee Brace. The hinges will be a good feature for you, and having the compression with give you added support and relief. If you have any further question, please feel free to contact product support. I am an avid distance runner, but having an OA problm with my left knee (medial). Can I run with this type of brace, and which one would be best alternative for running? What is the frame on the OA adjuster made from? Aluminum? I have Lyme disease and my symptoms are severe arthritic pain and I'm wondering which brace you would recommend? Thank you for contacting product support. All of our OA braces provide relief to osteoarthitis depending on the severity of OA. The OA Adjuster is for people who have moderate to sever PA and are highly active. All of the OA braces are made to unload the painful compartment of the knee. While the OA adjuster is for moderate to severe OA, the OA lite is for mild OA. All of the other braces kind of fall in between. If you go to our website Betterbraces.com https://www.betterbraces.com/knee-braces/arthritis-knee-braces All of the rigid braces are for OA in one compartment either medial or lateral. If you have general arthritis pain throughout the knee the Reacton knee Brace might work better for you. The web design takes absorbs shock and dispearses it away from the painful areas in the front of the knee. If you do have compartmental OA speak with your physician about which of the rigid braces you might need. I recently had lateral retinacular release survey just over a month ago, and they discovered that I had a partial ACL tear, and a tear in my lateral meniscus. The doctor is trying to get scar tissue to grow around the ACL tear. I want to get back active, I like to jog, cycle, run, and swim laps. Is this a good brace for me. Thank you for your help. Yes this would be a great brace, you would want to order a lateral unloader. For insurance questions please contact our Insurance Division at 1-800-548-3370. I have osteoarthritis in both knees and a probable torn meniscus (even with an x-ray, the radiologist and Orthopedic surgeon couldn't tell! ), but it was a painful injury and is healing. Even before the injury, I had osteoarthritis, due to various skiing, cycling injuries, and my age (60) The doctor is recommending eventual knee replacement but I want to avoid that by losing weight and using a brace, as well as getting hyuralonic acid injections, which the Dr. is willing to do. It will take me a long time to lose the weight I have, given my mobility, but I must try. What sort of brace will take the most pressure off my knees AND provide patellar stability (it sometimes feels hyper-extended) for activities like walking and stationary biking? The ones I've seen for osteoarthritis don't seem to fit round the patella. Swimming is also highly recommended. Would I need a different brace for that? The Donjoy OA Adjuster 3 would be the most appropriate choice for your injury and activities. You will want to get a 10 degree extension stop installed to assist in preventing hyperextension of the knee. I'm a bit confused by the medial and lateral distinction. I had a minor meniscus tear on the OUTER RIGHT side of my RIGHT KNEE which has healed for the most part, but still gives me some pain. Is this considered a lateral meniscus tear, and would I order a lateral OAdjuster in order to put the load more on the opposite (inner side) of knee, or do I need a medial OAdjuster in order to put the load on the medial side???? You are correct - because you have a lateral meniscus tear, you would want to order a Lateral OA Adjuster Knee brace to unload the lateral compartment of your knee. If you have further questions, please feel free to contact us at 888-405-3251. According to FDA lauws it is ILLEGAL to sell a brace such as this to anyone. This is a prescription item and is specific for one person use only. We will not and cannot advise on the reselling of our product. i am disabled and have OA, .Lat. release and total knee replacement (R). Will medicare and my supplement pay for a knee brace like this? Thank you for taking the time to email us here at www.betterbraces.com regarding our DonJoy OA Adjuster. This product would assist you with off loading your lateral compartment. However, we do not process insurance claims so you'd have to refer to your insurance company to verify if they would cover this product for you. Take care. The product instructions do not indicate how to put the straps back on, but if you give us a call, we'll be happy to grab a product specialist to walk you through it. If you do take your brace to the breach, you must be wary of sand entering the hinge. After each immersion in salt water, rinse the brace in freshwater. To wash the liners, hand wash in mild detergent and let air dry. Will I be able to ride a motorcycle ? The DonJoy OAdjuster Osteoarthritis Knee Brace should not prevent you from your normal activities. This Brace was great at first. I had it for a year before the adjuster mechanism cracked. Don Joy did not support a repair of this brace . I was told I could buy a new one only. I did not have another $700.00. I went without and ended up disappointed in DonJoy as a whole. I had my medial meniscus removed at 19 and am now 28. The last two years I've received sinivisc injections with some positive results. The last injections didn't take well because of a bad fall on my knee so my Ortho recommended getting an unloader brace. After a week of use I've noticed a huge difference. Usually after a hard days work I could barely walk or my knee would constantly give out, I recently worked a job at Michigan Stadium running up and down stairs with a 60 pound back pack and 25 pound side bag with no pain during or after. It's gotten to the point that if I don't wear the brace I feel the difference. It takes a few days to break in and get your leg accustomed to wearing it, but the more you wear it the faster your body accepts it... In moderation of course. I started 3 hours the first day, 6 the next, then 12 on the third day and I had minimal skin discomfort. I also ordered the cotton sleeve and in cooler weather it will for sure make the brace even more comfortable. If you are on the cusp of getting this brace I can say I was totally against it until I had no other choice and I wish I would have gone with the brace years ago. Cons: ineffective; sent it back, still awaiting refund.